Someone has this at auction on eBay with a starting price of $250.00. Absolute Stupidity! 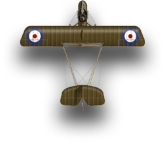 Especially as it was a reprint in the 2nd release of the Fokker D.VII. thats weird, the sellers got a few other minis fairly reasonably priced. I could have made a fortune selling my spares! (except, of course, none of them would have sold at even half that price). Even an original Nexus model is not worth $250. D.VIIs are not selling for much right now. I sold an unopened Udet this month on eBay for only about $35. WOW I can't believe someone would pay that much. I wonder how much you could get for the Series I planes as a set ? No one is paying that much for them. Most unopened Series 1 minis are going for about $35 each. S.E.5a and DH.2 are the top dogs right now. An S.E.5a recently went for around $50 and I've sold several DH.2 between $45 and $80 each. Just depends on the pilot. Not 150, but 75, and in used condition - C'mon a Nieuport 17, I mean it is pretty, I love mine in the arsenal, but game-wise, unless put against an Albatros, you are screwed most of the time. Look, it is just a phenomenon of jerks out there on ebay. Once something becomes OOP, these rats appear out of nowhere to capitalise on the idiocy of some people. But that is alright, we aren't idiots... That being said, when the new batch of releases will come out, those traders will be left out. By the way, does anyone know when the next new batches are to arrive? I am kinda irritated that I can't find a second Camel to make leader and wingman camel formation, and also that I can't find any SE5a's and Fokker DVII's. I mean sure, I can buy alternate or go to shapeways and use the MATES found on this website. But even if I paint the most neat paintjob ever, the difference will still be stark. I did ping the original post seller and tell him that was a silly price and no-one in their right mind was going to spend that much as there was another (the same model) on ebay for $35! I'm not sure how to relate to this. Since the only way to get most Wings of Glory planes is here or eBay I've paid quite a lot for out of print planes and balloons to round out my collection. Most, if not all, were from users on this forum. Most were for very inflated prices compared to MSRP. I didn't feel like an idiot, well a little foolish (or OCD) about a couple of purchases. Nor did I think the people here who sold on eBay were rats, just profiting off the market so to speak. Even though some were higher than I though they should be, at the time it appeared to be the only want to get those models. I have found that a lot of the Wings material on eBay is reasonably close to msrp and have even purchased from several people on there. Having said that the most I've paid for an item is $10 over msrp and that was for an ultra rare plane. While there are planes I still need for my use, I try to find the best deal out there and then wait, yeah I've lost some purchases this way but my money is tight and if it was meant for me to have it, it will be there when I get the money. Been watching on Fleabay and it seems prices are dropping a bit. Suspect with the lack of new figs the game is dieing. People are thinning their game collections and dumping them on Fleabay. Sorry for repeating myself but it's often a thought. At some of these prices I've thought about dumping everything and see how much I could get. Just a thought though. WOW so I am sitting on a bunch of money. But like most collectors you collect but never sell. I think the only planes I am missing are the repaints since I have the originals. Relating back to your comment, yeah, what I meant is SOME people are like that and these some wait for those that will fall for their prices, but most people won't. Should be more specific about that one "SOME" there, no harm meant, sorry if it was taken wrongly. I do however sometimes see things (not only models, car parts for example are another thing) that I may really need for a project or to fix something, having hopes up that I get what I was searching for since it is out of production, then just to open and see and over-pricing and sometimes an over-rated pricing. As for the last comment, it dying out or something, well, I don't think it will die out, some people just move to new stuff, some people will stay though and will find other ways of getting the models. I am thinking that when the new toys arrive, there could be a regain of interest of this game. We'll see. in 4 separate auctions from the same seller for 20.50€, 14.50€, 13.56€ and 12.50€ respectively. Starting bid 10€ each, once RFB, never played, cards still sealed....made me a happy guy. Unfortunately, many other sellers are going completely crazy with their prices. I bought a couple collections off ebay in the last few weeks trying to rebuild my collection after the fire. Big lot prices were very reasonable in November and December. However, there is someone who jumped on the scene after Christmas and spent ridiculous money on the last two sets that only had one or two of the really rare aircraft in them.